5 Seconds Of Summer are currently in the recording studio writing new music with Simple Plan! 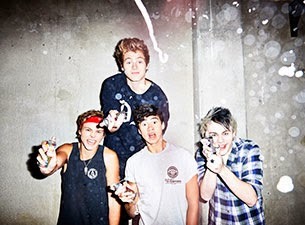 And if that wasn't enough, guitarist Michael Clifford has posted a video of them singing along to the Canadian pop-rockers' 2003 single "Perfect" during a late night jam session. The Aussie pop-rock four-piece have been recently writing new material with Josh Ramsay of Marianas Trench, Deryck Whibley of Sum 41 and The Madden Brothers.